This campaign and website has been researched and developed on a volunteer basis, without funding or income. The site is also free of advertising. ● Over 20k Facebook Likes for one page. ● Over 46k separate visits on election day. If you agree this offers a way to help revitalise our democracy and improve UK politics, please contribute. Even small amounts will help us do more, and help us to help others, to make this a national campaign. The information and argument has been researched and written by Simon Pardoe, with support and reviews from Alan Golding and other friends and colleagues. "Faced with the overwhelming public anger at UK politics, and determination not to vote, I found myself suggesting people Vote NONE as the only potential form of participation. Surprisingly, it shifted those conversations from anger about UK politicians to a shared concern about how to revitalise UK democracy and improve UK politics. I realised that whereas not voting can be an end to thinking and engagement, the option to Vote NONE can re-engage people in thinking about politics and democracy. Suddenly there’s no reason to be silent, and every reason to think about what to do." The website was produced in HTML5 and CSS using [Brackets] free online software. It is based on an original design by Gareth Dennison. It is designed to be accessible, and all coding by us is W3C Validator approved. We welcome feedback. If you encounter a technical problem that is not simply caused by an old browser, please tell us. Thank you. ● Over 20k Facebook Likes for just one page. 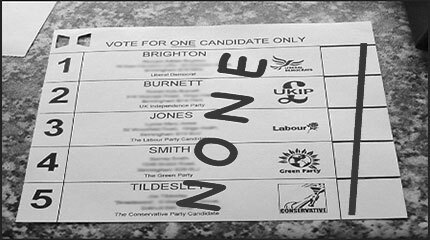 > Write NONE across the ballot paper, so your intention is clear beyond dispute. Why? > Do not put a cross or tick anywhere! Simply put a single line through all the boxes. > Do not write anything more. Just put it in the ballot box.